All engines use oil as the lubricant for their engines. When the engine is running, moving parts rub together creates friction, which in turn generates a lot of heat. If the heat is not effectively siphoned off, the engine can overheat. Constant overheating of the engine can even lead to corrosion. This is why its important that you watch the mileage. An oil change & lube should done at 5,000 miles to 7,500 miles, or every six months (whichever comes first). But keep in mind that the conditions of your driving also should come into play. 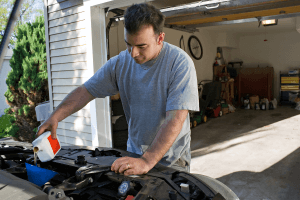 Severe driving such as off-roading, excessive idling even driving a very low speeds over long distances means that you should get oil changes more frequently. Free FULL inspection of your car!